As I mentioned yesterday, I spent this week on a razor’s edge worrying about my job, so after work last night I met Nurse H for a badly needed libation. I met her on the Upper East Side of Manhattan. Although I lived in New York City for two solid decades, I spent very little time on the Upper East Side. I lived in downtown Brooklyn and the Lower East Side, so 23rd Street felt like uptown to me. The Upper East Side has always been one of the safest neighborhoods in the city. Consequently, a lot of single women live there. It was a long subway ride from where I lived and the only time I took the 6 train was when I dated someone from up yonder. Plus, it wasn’t my kind of energy. It was (is, always has been, always will be) monied and I never had any, so I felt out of place there. But the homes are incredibly beautiful. In the early 1990s, I met a girl who I thought was the love of my life, but she didn’t see it that way. When I walk up 3rd Avenue near 91st Street I’m reminded of those happy/sad days. 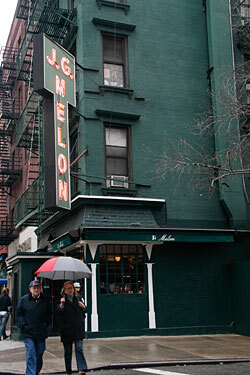 Nurse H and I met at JG Melon which is a BAR bar on 3rd and 74th. We’re in December-budget-crunch mode so we sought out something reasonable which, in NYC, can be quite a challenge. It was windy and frigid out, so there would be no pleasant strolling down the Avenue. After drinks and a bowl of chili (perfect for a cold winter’s evening) we hustled to the nearest movie theater to watch 007 go through his painful motions. It’s going to be a long, long time until they make a Bond movie that’s as good as Casino Royal. Movie ticket = $12.50. Small popcorn + small soda = $10.50. So much for the budget crunch. Believe it or night, even with all the old money, you can probably get the most real estate bang for your buck on the Upper East Side of Manhattan (at least east of 3rd Ave).